TGS Garages & Doors sells, installs and services quality commercial garage door openers for both commercial and industrial buildings in New Jersey. Commercial door hardware takes a lot of stress from the repetitive opening and closing throughout the day. Strong and reliable commercial and industrial garage doors are a necessity for businesses. When your company garage doors are not working properly, you are losing much more than sleep. LiftMaster has developed a full line of operators that provide premium levels of sturdiness and resilience. You can rest easy knowing that your company garage doors will function properly. Our team of consultants will provide you with various options of commercial garage door operators to ensure the best option for your business application. Once you make your selection, our team of overhead door experts will install & test the garage door operator and impacted system elements to ensure maximum safety and functionality. 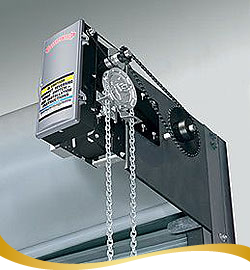 Trolley operators are typically used for standard lift sectional doors, and are available in light, medium and industrial-duty. LiftMaster® Fire Door Systems control the closure of a rolling fire door, counter fire door, fire shutter or track door in an emergency situation, and stop the spread of fire and smoke from one area to another. Accessory packages for firehouses and automotive dealerships are also available. TGS Garages & Doors obtains new certifications from LiftMaster & IDEA, relative to commercial installation, yearly.